The beauty of taking on a major project, whether it’s a self build or renovation, is that it gives you the opportunity to create a home that’s truly tailored to your family’s wants and needs. It may not be to everyone’s liking, but it’s yours... and that’s something worth fighting for, as the Jaques (page 36) found when they had to go to appeal to gain planning consent for their Georgian-inspired house. 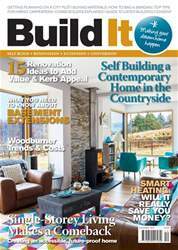 In fact, this month’s reader homes serve up a real variety of architectural styles and inspiring stories – from the Roses’ contemporary prefab box in glorious countryside (page 20), through to Liz Ashley and Brendan Bracey’s wow-factor extension of an Edwardian terraced house, complete with a jaw-dropping guillotine window (page 29).